— Dorothy in “The Wizard of Oz”. The graph below gives an ugly forecast. But let’s keep this in context, especially now that the doomsters have discovered it. The value of the Atlanta Fed’s GDPnow forecast is its immediacy. They explain that it’s no more accurate than forecasts by economists or other models. Which is to say it’s a best guess made with limited information. Also, the Fed remains hopeful that Q1 is an aberration, so that 2015 has growth of 2.3% – 2.7%. In January 2011 the Federal Reserve governors estimated the long-term growth rate of the US economy at 2.5 – 2.8%. Now it has fallen to 2.0 – 2.3%. That’s a large drop, which would have a massive effect on America over the next decade or two. Years of low investment by the private and public sector (see links below), a decaying education system, rising debt levels, and demographic headwinds (an aging society) — all these things slow America’s growth. Hopes for this cycle’s boom are dropping even faster, as seen in their GDP forecasts. Note how expectations for 2 years out have come down (from 3.0% to 2.5% to 2.3%). 2015 from 3.0 – 3.8% in Sept 2012 to 2.3% – 2.7% now. 2016 from 2.5 – 3.3% in Sept 2013 to 2.3% – 2.7% now. 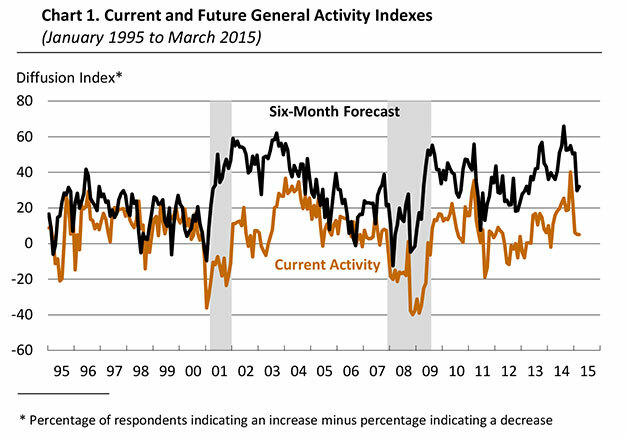 They are confident, as economists usually are, that there will be no recession in the next 2 – 3 years. Recessions are a surprise. Since the last update we’ve had more weak data. Industrial production peaked in November, with February -0.5% from peak. Retail sales peaked in November and have dropped for 3 months, with February -2.3% from peak. Business inventories have risen faster than sales since April 2011, pushing up the inventory/sales ratio by up 8% through January (with an especially fast rise in Jan and Feb). The slowing has been broadly based (not just petroleum, which is a small part of the economy). It’s also been geographically broad, not just in the cold Eastern states. Some data has been strong. The Baltic Dry Index — the cost of moving bulk cargo by ship (e.g., coal, iron ore) — is 571, up 12% from its record low of 509 on Feb 18. The major indicator of housing construction was mixed in February (permits strong, starts weak). The US economy might be in the dilemma described in previous posts: we’re unable to accelerate but any slowdown quickly takes us below stall speed of 2%, below we’re at risk of recession. See The dilemma of the US economy: can’t take off & too close to the brink and Has America’s economy entered the “coffin corner”? Should the US fall towards a recession, the Fed could do QE4, since the first 3 rounds had no obvious ill effects. But the government’s arsenal has more powerful weapons, as other nations have tested extraordinary tools for government economic stimulus. First, the Fed can set interest rates below zero (a history of negative rates here; see these briefings at VOX and Bloomberg View). A second and more powerful stimulus comes from government spending — directly employing workers and fixing America’s rotting vital infrastructure. But how to pay for it? Raising taxes negates the stimulus. Borrowing raises the government’s already high debt ratios, just as the boomers’ retirements begin to boost it — which will continue for several decades. Japan has tested a third way on a large scale: the government issues bonds which the central bank buys. It’s called monetizing the debt and was long feared as inflationary. Japan ran its net debt to 140% of GDP as its fiscal deficit accelerated to fantastic heights (one of the three arrows of “Abenomics”) — but its debt now shrinks as the central bank’s purchases of 80 trillion yen/year (US$658.7B) exceeds the government’s new debt issues of ~50 trillion yen. With the economy growing (albeit slowly), debt/GDP falls. It might drop by half during the next few years, with no undesired inflation. See this for more analysis. Fourth, the Fed can buy corporate debt, mortgages, and even stocks. They did the first after the crash, and the second on a large scale during QE3 (Bernanke foreshadowed this in his famous 2002 “we have a printing press” speech). The Bank of Japan has bought stocks on a large scale. It always gets applause. Should a recession loom again — that would be the third slowdown since the crash — the government almost certainly will use these tools. Lines have been crossed, and we cannot go back to the old world. If done with sufficient size such measures will boost the economy. They appear to have few short-term ill effects. We’ll be guinea pigs testing their long-term effects. One pleasant side-effect is that use of these tools probably will send risk market prices to even higher levels, as markets have long since abandoned any connection to valuations — trading instead on Fed policy. Art or stocks, they are all just trading cards to the speculators that run our markets today. History suggests that this bubble will end badly, with unknowable effects on the economy. Status report on the US economy: darkening sky, rough waves ahead. Previous Post The key to understanding our wars: the trinity of COIN. Next Post Government officials’ lies erode the Republic’s foundation. Do we care? Great article, FM. Especially the part about monetizing the debt, I’ve heard about it but didn’t really understand how it works until now. At first glance, it seems like a neat little trick that does not have any obvious side effects or consequences, like when FDR took us off the gold standard during the Depression. Considerable further study is, of course, required. One roadblock to adopting such a plan is the Republicans. This sort of “government has infinite cash” meme leads directly to their continual fears that Americans will all turn into shiftless wards of the state unless economic hardship toughens us up. It trips a lot of other issues for them as well. If I recall correctly, getting off the gold standard was a huge struggle as well with a number of prominent politicians and economists predicting that our world would end even though there were several other countries had already abandoned the gold standard without obvious ill effects. (1) Great Heinlein reference! Beyond this Horizon was published in 1942, when he was a New Deal Liberal, before his evolution into a far-right conservative. (2) It’s fascinating to contemplate how the GOP would react to a recession? I hadn’t thought of that when writing this. They (& the Democrats) supported the first stimulus bill under Bush. All present Republicans in the House voted against the 2009 Bill (can’t help Obama, screw the US). (3) FDR was able to go off the gold standard (temporarily) for the same reason he enacted the New Deal: massive Dem majorities in Congress. But as you note, conservatives predicted that this would bring about the apocalypse. I think we all know exactly what Congress would do in the event of a recession: nothing. Republicans would first blame Obama (very loudly and proudly of course, as they will have been waiting and planning for that moment for years), and then they would follow up by saying it’s all because poor people aren’t working hard enough, and because black people, immigrants, and unions are stealing all the government’s money via kickback welfare programs. Democrats would blame rich people and corporations for not paying enough taxes, proclaiming loudly that more high-end taxes are the end-all solution, but be unspecific about where the extra money would actually go. Basically, we’d see the same thing we’ve been seeing in Congress for the last several years; a lot of whining and complaining, throwing blame around, but nothing constructive. It’s fun and easy to assume equivalence between the two Parties. It is also often quite false. This business cycle decisive,y disproves your assertions about the Democrats. The Economic Stimulus Act of 2008 had Democrat Nancy Pelosi as sponsor and passed with Democrats’ support: 47-0-3 in the Senate and 216-10-1-5 in the House (yes-no-present-not voting). Despite Bush as President. Thanks for the reminder about the 2008 stimulus. Although the aggregate effects of that bill were debated at the time and even still today, when I walk down the street in 2015 I can see public works projects that it partially funded. As far as the parties’ equivalence, I would have to agree. I can imagine any similar efforts today would have a similarly lopsided tally of votes. It is fun to speculate. You believe that a stimulus bill today would have strong bipartisan support, as did the 2008 bill? That seems very unlikely to me. The GOP opposes almost everything Obama proposes, even if it is something they formerly advocated. Indeed. This is what I meant to say. I think many would agree that a Federal Stimulus bill along the lines of the one in 2008 would likely not happen in today’s political climate. 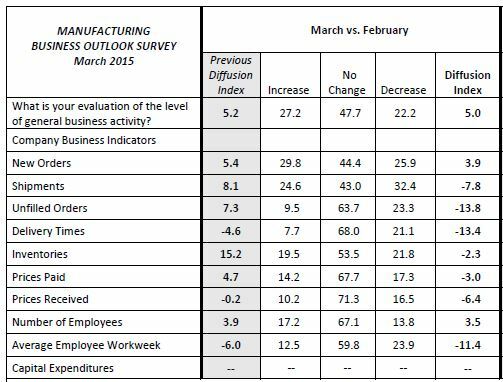 The Phil Fed March 2015 Survey — The headline was unchanged at slow growth (from 5.2 to 5.0). The subindexes collapsed, all down from a little to a lot. Well, the Federal Reserve could always pay people directly, via helicopter drop or otherwise. I don’t think any nation has ever attempted to monetize *individuals*, but it might be the most effective way to get that money into circulation and to produce the desired inflationary effect. That is not an accurate description of monetization. The Treasury and Fed are both agencies of the Federal gov’t. Monetization is a result of the actions of both. The tax cuts and credits seen in the 3 stimulus bills (2008, 2009, 2012) all in effect gave money to individuals — and increased the debt. The net debt drops when the Fed buys the debt (I.e., including the CB on the gov’t balance sheet). The Fed monetizes when it in effect (de facto) or explicitly cancels the bonds. As has been shown repeatedly and extensively, the stimulus is FAR higher from gov’t programs putting people to work than just passing out money — plus we get our rotting infrastructure rebuilt. Monetization is one path. Conservatives refuse to see this, part of their “eyes tightly closed” guided by ideology strategy. It makes them as easily guided as sheep. No need to be rude. I’m not talking about fiscal stimulus at all (the theories of which I do understand, by the way). All I’m saying is that central banks still have many unconventional options for monetary stimulus, even with interest rates at or below zero. QE was unconventional, but it doesn’t necessarily have to stop at mortgage-backed securities. Theoretically, the Federal Reserve could buy anything: municipal bonds, corporate bonds, stocks, oil futures, candy bars, old socks, or even nothing at all, as a way to stimulate economic activity. If you think this suggestion indicates a lack of understanding, then please tell me why it couldn’t (or wouldn’t) be done. I gave you links explaining what these theories actually mean, and their application. If you have anything more, please give us a cite by an economist (there are countless writing for general audiences. Also: pointing out that you don’t understand is not “rude”. This isn’t a tea party. I’m only trying to have a discussion, not to argue or frustrate. I do think that many applications of monetary stimulus can indeed create the effective equivalent of “burying money for people to dig up”, and I think we can see that effect in the waste associated with asset price bubbles. Of course it would be better if productive stimulus were accomplished by traditional means (via Congress), but absent that, I don’t see why something along the lines described above should be out of the question. I see no evidence that you have much understanding of the issue. Nor any interest in learning anything about it. As I said, I suggest you stick to citing actual economists. As for the UK idea, that’s a technical point about the implementation of QE. It’s a nice idea, but of limited significance — and so of limited relevance to this post. Is an article explaining the three competing theories of how banks influence the money supply. The Mr. Werner they cite is an interesting guy. It appears he may fit FM’s criterion for one who made a valid prediction about the GFC. When Japan first stumbled in the late 80’s the BOJ announced they would start easing rates which were still 7%. Werner published in a Japanese major newspaper that he predicted this would not work and that soon Japan’s banks would fail. This was all based on his Total Quantity theory of money supply. Hope you find time to read it FM. This a peer-reviewed journal, although quite an obscure one. It is a review of Werner’s theories by Werner. It is of interest perhaps to economists, but imo life is too short for laymen to bother with this kind of material. You could spend a lifetime reading fringe (i.e., non-mainstream) papers and end up knowing little. Usually I see people citing these things who don’t know what the mainstream views are (often lacking even introductory level course understanding), and so have no context to evaluate them — hence using these as a mechanism of confirmation bias (motivated reasoning). More specifically, this is “Google knowledge” — searching for dribs and drabs of data to support one’s belief. I recommend instead finding authoritative sources that disagree with your views, to challenge your beliefs and learn new things. Why don’t we say the same thing about Climate or COIN. Just go with the mainstream consensus. I read this blog because you don’t do that here. I’m confused. And just like Climate and COIN if the minority view is credible it has vast and important policy implications. It also threatens our ruling elites. Tear down this wall Mr. FM. Experts in a field deal with minority views routinely. That is how they sometimes become majority views — but rarely. Looking just a fringe views that meet your preconceptions, when you have little understanding of the basics, is a waste of time. You are learning nothing. Watching discussions among experts about the hot questions can be informative, although we lack the ability to decide who is correct. Rooting for one team of experts in a field you don’t understand is just entertainment, like watching football — without the cheerleaders. If you enjoy that, each to his own. But we don’t get physicists with nutty physics ideas running for president threatening to implement policy based on them. If we did I dare say non physicists would jump all over that guy notwithstanding lack of expertise or at least they would pick sides in the debate. Rand Paul is exhibit A in this case. I don’t see any relevance of that to this discussion. Zero. We need not be experts ourselves to form opinions about which experts we trust. If a candidate came out saying he would spend $trillions on perpetual motion research experts like physicists would be asked to opine. They would largely laugh at the absurdity of the idea. Public opinion might turn away from support for the idea and the candidate. In more tenuous disciplines like Climatology the issues are murky and choosing sides is problematic for laymen. In economics the problem is worse. But side we must. Choose we must. Or else what? Flip a coin when we vote, or support a policy or a candidate? Money theory? As a non expert I find it interesting and sensible. You can form opinions about anything. Have a logical basis is a higher bar however. Choosing experts in fields you don’t understand is largely an exercise in confirmation basis, ignorance in motion. Works for choosing a fav football team, but not so much for anything serious. Yes, that’s my point. The consensus or mainstream view of experts provides a more useful guide than your layman opinion. Stick with the mainstream opinion of the relevant experts. Your own “analysis” shows the peril of doing otherwise, quickly going into the weeds about things you have little understanding (i.e., neutral mix of accurate and wrong). I’m a nice guy or would have moderated your comments long ago. Your opinions are uninformed and largely fallacious. This time your burn reading fringe science would be better spent reading an Econ 101 text, or careful reading of the weekly Economist. So how crazy is Steve Keen? The Economist magazine is not much help. Based on what I know of applied math he’s not crazy at all. I search in vain for a criticism by any mainstream economist. Krugman punted. Thank you for your indulgence. I assure you I am not here for self gratification. I’m worried Keen could be right. Soon. “in 2009 … Steve Keen at the time was shouting and waving his arms warning that our entire financial sector was poorly understood and that we are entering a debt deflation worse than we saw in the Great Drpression. Six years later it’s obvious that forecast was wrong (if in fact Keen said that). Decisively wrong. It’s sad that you don’t see that, but after long experience with you it’s not surprising. What happens next is a more interesting question. There is, however, no evidence to date that we’re repeating the 1930s. Such forecasts — that the next cycle repeats the last — are easy, get applause from laypeople, and are almost always wrong. With the ECB finally starting its own round of QE, how effective would US QE4 even be? How effective might QE4 prove? Probably quite effective at lowering the value of the US dollar. The world is slowly sliding into rounds of stealth competitive currency devaluations. In a recession US exporters’ complaints about the massive rise of the dollar vs the currencies of our competitors (the broad trade-weighted index of the dollar has risen 20% since last July!). Probably not effective beyond that, even at lowering interest rates. Hence my belief that stronger unconventional measures would be used.